The Memphis Coin Club, Inc. was founded in 1936 and has been a member of the American Numismatic Association (ANA) since the founding of the club. 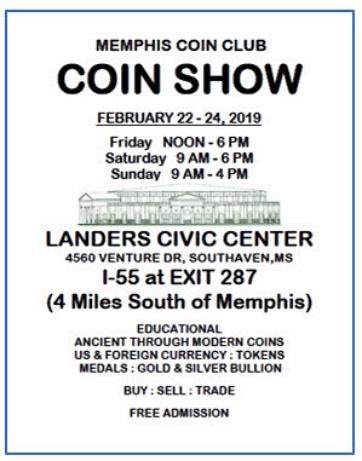 The club hosts a show in the Memphis area each year: The Memphis Coin Show. Please visit the section of the website dedicated to this show. Several members also often attend shows throughout the United States, particularly in the Southeast. Several members also often attend shows in throughout the United States. Information on upcoming meetings, exhibits, shows, and other events can be found here. Common questions on a variety of topics. You can find answers here. Question? Problem? Comment? We want to hear about it. Click here to send us an email.